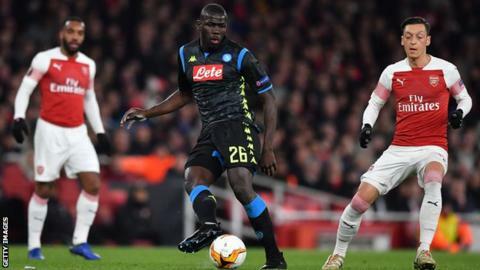 Arsenal have launched an investigation after a social media video appeared to show a fan racially abusing Napoli’s Senegalese defender Kalidou Koulibaly. The supporter can be heard using a racial slur in the video, filmed during Arsenal’s 2-0 Europa League quarter-final first-leg win on Thursday. “We utterly condemn use of this type of racist language,” Arsenal said in a statement on Friday. The club reiterated they have a “zero-tolerance” approach to such behaviour. On Thursday, Chelsea barred three fans from entering Slavia Prague’s stadium after video footage showed them calling Liverpool’s Mohamed Salah a “bomber”.